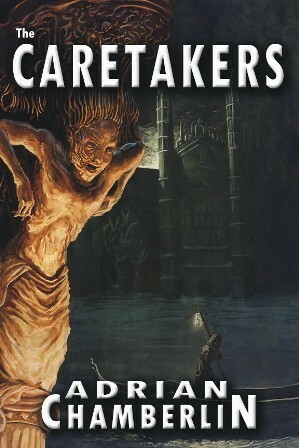 First published in April of 2011, British author Adrian Chamberlin’s debut novel ‘The Caretakers’ saw its eventual release as one of the early publications by the horror writers collective Dark Continents Publishing. Every inch of All Souls College in Cambridgeshire is heavily steeped in tradition. Traditions that have been adhered to since the impressive gothic building was first erected. And with the annual midwinter banquet approaching, the secrets held within the college are once again haunting its quiet stone walls. Some see Andy Hughes as just a thug. Upon finding his secret in their attic, his girlfriend Jennifer Callaby is beginning to agree with this popular consensus. So much so, that when she finds out that Andy has once again been locked up for the night due to his uncontrollable temper, she decides enough is finally enough and leaves him. When Andy arrives home he is greeted by an empty flat and the intriguing offer of a new job. Outside of his usual line of work, the offer is to locate someone by the name of Geoff Micheals who went missing around a year ago in Cambridgeshire. Knowing that is where Jennifer is now staying with her parents, he accepts the work. Meanwhile, Jason Franklin is listening to the voices again. Having been locked up in the mental asylum for almost a year after his attempted arson on All Souls College, he now quietly listens to the enchanting voice of The Elder. He knows now is the time that he needs to escape and finish the job he started a year ago. Upon arriving into Cambridgeshire, Andy meets up with old college pal Rob Benson, who’s currently cradling a very sore head. Not before long, the two discover the decaying corpse of a wild boar in the back of Rob’s work van. Rob has absolutely no idea how the carcass got there, but the dent on the front of the van suggests his drunken drive home the previous night may have something to do with it. The first in a long line of odd connections and not-so-coincidental coincidences is revealed when Andy learns that the missing Geoff Michaels’ last known address was in fact living with none other than Rob himself. The same residence where Andy is now staying. This is surely no coincidence. But things start to get weirder, when Rob’s casual girlfriend suddenly disappears, and all of a sudden, the corpse of the wild boar is bizarrely reduced to ash. At the heart of it all lays All Souls College. Everything strange that is going on seems to be directed at the college. And their inherent secrecy is only furthering Andy’s growing suspicions. Together with ex-college lecturer Phil Lotson, Andy and Rob begin to uncover the dark truth that has lived with the college for centuries. An appalling secret has been kept from public eyes, with the supposed love of humanity in mind. Although the college is shrouded in a thousand secrets, the trio find they have more than just luck on their side. For his debut novel, Chamberlin has well and truly taken the bull by the horns and embarked upon an intrinsically elaborate and mystifyingly contrived storyline. At times the plot seems to veer towards the outlandishly surreal, to be quickly pulled back in again into a chaotic reality from the carefully calculated rationale that the author meticulously accompanies the storyline with, each and every step of the way. This is certainly not a through-and-through horror novel. Nor does it fit the tightly bound realism of a thriller. But very justifiably meeting somewhere between the two, with a hefty slab of mystery thrown in for good measure, is where the novel happily (and satisfyingly) finds itself. Characterisation is absolutely superb throughout the novel. Chamberlin has lovingly portrayed each of the characters with the same care; working on their individual personalities and emotional responses to the dilemmas confronting them. Rob Benson’s inherited dog, Jasper, helps build further emotional bridges with the reader, in a similar (but altogether less dramatic) way to that of Sam in Richard Matheson’s classic novel ‘I Am Legend’ (1954). Chamberlin utilises a handful of recurring themes from a number of his previously published short stories. Re-animated undead animals take on another heavy role within ‘The Caretakers’ in a similar vain to that of ‘Warpigs’ (from ‘M Is For Monster’ – 2010) or indeed ‘The Bodymen’ (from ‘The Spectrum Collection’ - 2010). The complexities and multi-layered subplots that so ingeniously inter-weave throughout the tale are captivating with their inherent mystery and their unknown direction. However, as the various plotlines begin to slowly converge, Chamberlain masterfully pulls on the right strings at just the right time to plummet the reader into the action-rich thick of it all, with the simple ease of a great storyteller. For all its clever twists and turns in the plot, the multitude of well-developed characters, and the warmth of its locality, the reader can’t help but feel somewhat subdued by the relatively slow pace that has been maintained. Yes there is a veritable plethora of dramatic action packed scenes and twists that are undeniably integral to the plot. However, none of these are brought about with any degree of edge-of-the-seat urgency. The tale as a whole takes on almost a backseat to the proceedings, moving along at a constant jog that never really picks up its pace to any instantly compelling degree. Furthermore, one can’t help but feel that Chamberlin frequently gets bogged down in the various intricacies and elaborate explanations that construct the backbone of the story. However important they are, the delivery is done in a cold and explanatory fashion, rather than the more exciting unearthing of facts. At times the storyline does seem to meander a little too far away from its main direction, potentially loosening its grasp on the reader’s attention. What the storyline desperately cries out for is a more action packed and continuous subplot to tighten up the tale, maintain a more gripping pace and ultimately to inject the story with a substantial burst of energy. All in all, Chamberlin has created a wildly ingenious and elaborate story that swamps the reader from the outset with its many levels and mind-blowing intricacies. The unquestionably goliath and ambitious ending is impressive and fitting for the length and atmosphere of the tale. That said, the epilogue does allow the tale to sadly peter out somewhat, rather than hit the reader with the final punch and leave them simply gasping for breath. Once again, Chamberlin takes the safer ‘explanatory’ route here with wrapping up all (and I mean every last one) of the loose threads. Perhaps there’s a time when thoroughness should take a back seat to pace and punch. A thoroughly enjoyable and captivating novel nonetheless. And one which promises a lot more to come from this fresh face in horror. The novel runs for a total of 491 pages.